In other news, the collection of dev diaries available so far is excellent. I had a great time catching up on them over the past couple of weeks. Paradox is accepting sign-ups for the EU4 Tech Beta. The game will be available on Steam on August 13th (my birthday!). Nooooooooooooooooooo I haven't really truly properly played a full EU3 game even though I own all of the DLC. I am a horrible person! Plus, 10% off a pre-order if you own another EU game on Steam. Oh boy oh boy ohboy! I hope EU:Rome counts. I usually get my Paradox games off Gamersgate. Edit: Also, trying to not get too hyped. You know, just in case. It will show the 10% discount right on the Steam store page if you qualify. Hooray on a date! Wasn't expecting it to be so soon. Sadly I don't qualify for the Steam discount either despite owning all of their game since EU2. Looks like it's going to be Steamworks though, so maybe Greenmangaming or someone will have a deal before then. The latest Three Moves Ahead has an excellent show about EU4, featuring lead designer Thomas Johansson. I've never been able to get unto these games, but I've tried. Interest piqued. Thanks for the heads-up, Archangel! That's sooner than I expected, too (I'd assumed it would come out in September, closer to the end of 3Q). Happy birthday in advance. Also, hey Gunner! I remember you from the XCOM Let's Play I did. Could you do me a kindness and sign up for me with the link above? no need to sign up for newsletter. So I'm doing an email interview with Paradox about this game - does anyone have any suggestions/questions they'd like me to ask? I have about 5-6 so far. Thanks, glad to see you making your way over to GWJ. Huge fan of the blog! For the interview, I'm most interested in what love they've given to the naval side of things. Having fleets tie into the trade system is a fantastic start. Victoria 2's Heart of Darkness expansion had a few nice improvements with better combat and a restriction on how many big ports you could support. Anything along those lines planned for EUIV? Thanks Gunner! Added that one to the list. Just pre-ordered from Green Man Gaming, who's running a deal for either $7 off or a $10 credit. Seems to make sense if you're interested in the weird timed pre-order dlc bonus thing Paradox is running. Thanks for the tip, Gunner! Hmm. *browses* Doesn't look like there's any cashback/credit for Rome II (although that one does have the 25% off voucher). Ah, well. Also, my interview is now up! Advice will not be followed. I am looking forward to this game so much, I was surprised to see that it was $40 on Steam and not the $60 I was expecting. My only problem is that it only comes out a month before Total War: Rome 2. And that music video is great. Does anyone have experience preordering Paradox games through Greenmangaming? That is where I was going to preorder for the discount because my previous preorders have all gone smoothly with codes mailed out at least a few hours before release so anyone wanting to preload or start playing right at zero hour could. Then Civ V: Brave New World released, and the codes were didn't go out until the next morning because the publisher was late in releasing the codes to Greenman. For most games, losing the first night of gaming wouldn't be a big deal to me, but I'm heavily interested in Civ V and in EU. Does anyone know if Paradox usually releases their codes to Greenman in a timely manner? quill18, a Youtube broadcaster that does a lot of Paradox and Civ Let's Plays, just started posting a preview playthrough of a beta version of the game if anyone is interested in seeing some non-developer gameplay. I haven't had a chance to start watching yet so I don't know if it shows anything that hasn't already been shown/discussed by Paradox. Oh man, only a month to cram in as much CK2 with all the shiny new DLC I just bought ... pause the world, need more time, please. Latest developer diary mentions achievements: "EU4 will ship with 50 different achievements, all using the Steam achievements mechanics. Some are easy to do like signing a royal marriage, and some are slightly harder to do like dismantling the HRE. However, achievements can only be done in Ironman mode – you will need to earn them." At first I was all "No way," but then it occurred to me that even though I do tend to create save points save frequently "just in case", I almost never go back and reload a save if things go awry. So maybe Ironman won't be so bad. However, achievements can only be done in Ironman mode – you will need to earn them." It's funny, I never realized it until now, but I always play Paradox games in Ironman mode. The fun for me is in playing, not 'winning'. Those are the quill18 videos that I linked upthread last week. They've been pretty good so far. They've been a mix of 10 (so far) episodes of him playing a game as England and four or five episodes where he loads up the start positions of various countries and talks about them for awhile. As England, he's been fairly aggressive and warlike, but I think that is a combination of England's starting position and his desire to make videos with more action and less "downtime". In the comments of the last couple of videos, he has noted that his preview build expires soon so he is trying to rush as England a bit more right now to show off some of the colonial features. (I get the idea that the preview build he is using is now a couple of months old). 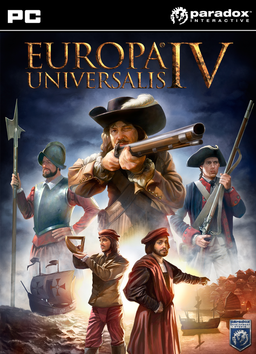 Back in May, his youtube feed also had a series of non-gameplay videos talking about various game concepts and the multiplayer game he and many in the press played at the EUIV press event. They are a lot less informative if you have been following Paradox's dev diaries as they are mostly just info dumps of him discussing the various systems in the game as detailed at the event, and most of this content had already been revealed in dev diaries. Man am I getting pumped for this release. Fired up EU3 last night and had a great 100 Years War romp as France, which was actually my first time playing the Big Blue Blob. Turns out that steamrolling everyone can be fun! Has everyone pretty much decided on who they're going to go with for their first play through? My traditional EU standbys are Sweden and England, though the Ottomans are calling my name a bit for some reason too. Not too much time left to decide!